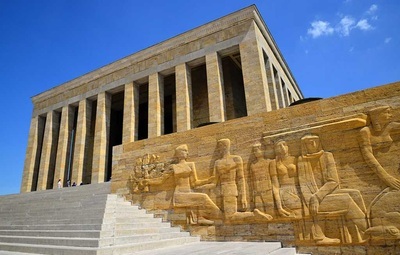 Anıtkabir or Ataturk Mausoleum is situated in the Ankara, which is the capital of Turkey and home to one of the country’s most significant masterpieces. This notable example of modern Turkish architecture was decorated by Turkish great architect Emin Onat and erected between 1944 and 1953. 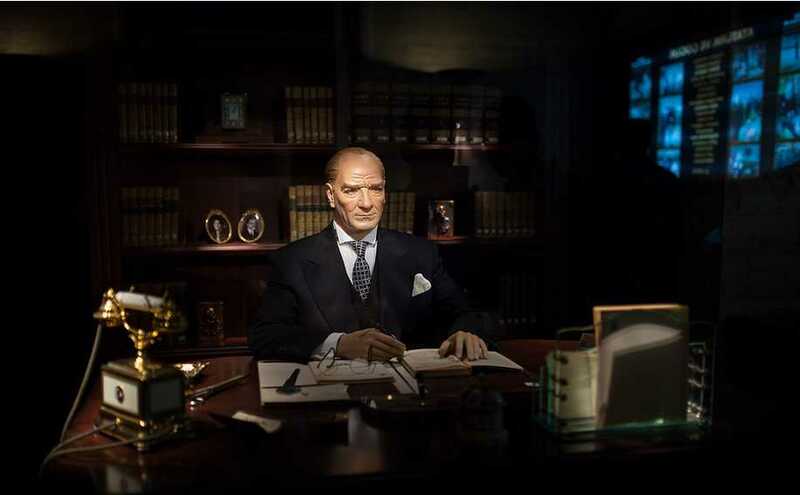 Being nationalist leader of Turkish people and founder, Atatürk is the first president of the republic of Turkey. He is not only important for Turks but also the other people from many different countries. When he died on 10th November 1938, his body moved to Etnography while Anıtkabir was building. 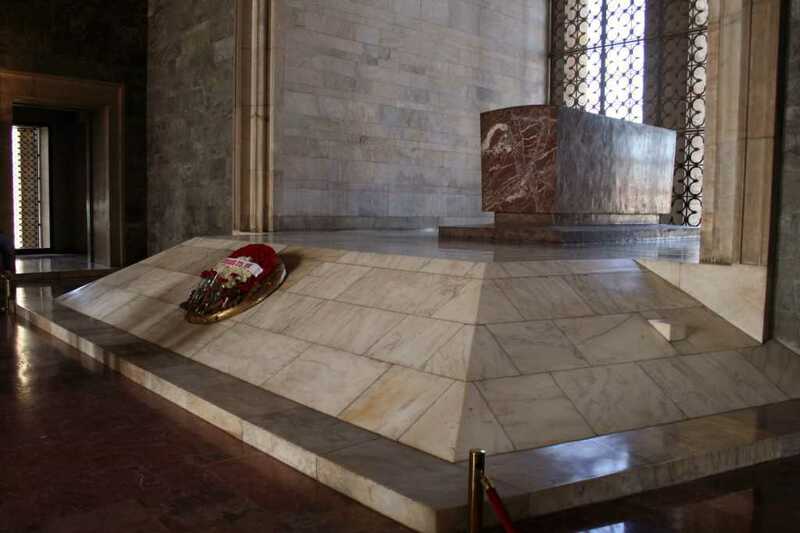 Ataturk did not say anything where he wanted to be buried before he died. However, while he was conversing with his friends, he stated that of course I will die someday. If I die, Çankaya (a province of Ankara) is very good location for my grave. Because of that, the Turkish people tried to fulfil his request in order to reflect their love and respect against him. Once upon a time there were many Phrygian graves (the ruins of tumulus) belonging to B.C XII century in today’s Anıtkabir. Within those tombs includes valuable goods but later they were sent to the Archaeological Museum. 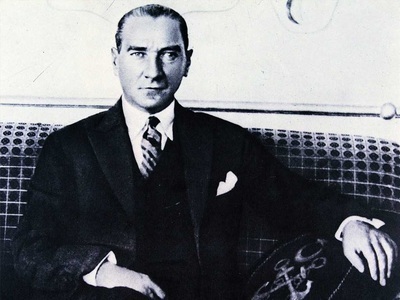 Its place was determined by Turkish deputy Mithat Aydın and the Turk committee of the period. Rasattepe with 906 altitudes was chosen for that famous Ataturk's tomb. Moreover, there was regulated an international competition by the same committee in 1941. Totally 47 countries with valuable projects such as Turkey, Germany, Italy, Austria, Switzerland, France, Czechoslovakia were participated in this contest. At last the projects belonging to Professor Emin Onat and Associate Professor Orhan Arda were accepted. The construction of Anıtkabir was firstly begun in 1944 but later it was completed in 1953. In the First Section: It was made the adjustment of land level for the tomb. 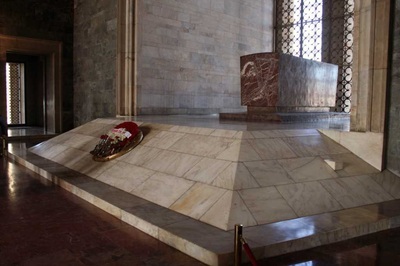 Additionally, the Reliance Wall (Istinat Duvarı in Turkish) was built on the lion road leaning down Ataturk’s mausoleum. It was completed in one year. In the Second Part: It covers the area of tomb, ceremony and around buildings added later. Also the project of monument’s mass had been planned within that place. Entry towers and an important section of that fascinating organization were finished here. Surrogated by many various trees such as Acacias, Ash Threes, Elm, Honeysuckle, Silverberry and Tamarisk Trees, that location contains the water system which creates a ravishing atmosphere. It takes 5 years. In the Third Place: The roads meeting the monument and Lion Road were finished in that space. The Parade (Ceremony) Ground and the tomb were furnished here. Moreover, the steps of stairs were made in that location. The Last Section: It is the last grade of the building breath-taking Anıtkabir. Honour Hall and the vaults were built here. That part was ornamented with the amazing stone profiles and eaves motifs which reflect Seljuk and Italian architectural syles. Covering 15 m2 areas, Anıtkabir is surrogated Istiklal (Liberty) and Hurriyet (Independence) Towers, Lion Road, Mehmetçik, Müdafa-I Hukuk, Republic, Victory, Revolution, Misak-I Milli (National Pact) and 23 April Towers. Its walls made from dark coloured Bilecik marble are 32 X 60 m in seizes and 20 m in the high. The ceiling of Big Saloon was furnished with the gold mosaics. 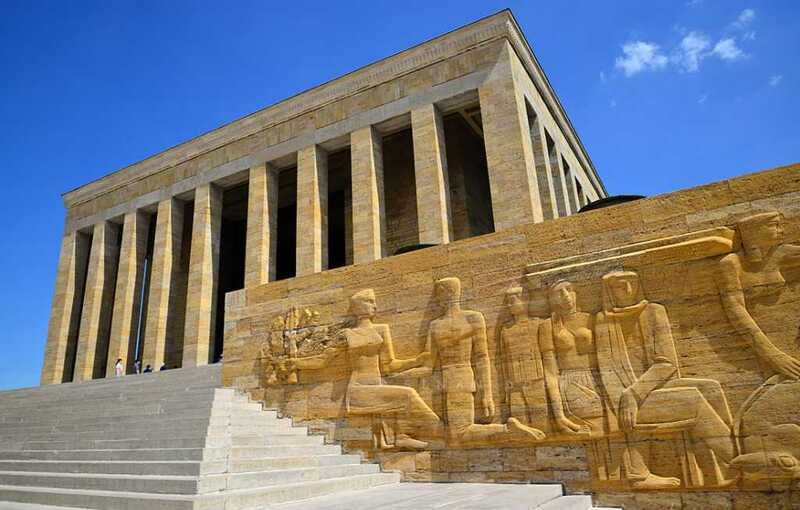 Located on the Anıtkabir, that glorious museum consists of Ataturk’s shave sets, sticks, gifts and other his possessions like many photographs about him and his valuable family. 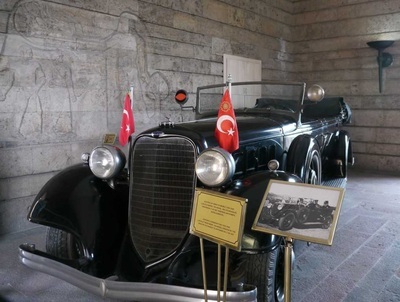 In addition to this, the weapons of famous Sabiha Gökçen (the first woman combat pilot) and Afet İnan (foster child of Ataturk) and the mini Koran belonging to Rukiye Erkine (another adopted daughter of him) given by Ataturk as a present were exhibited here. Moreover, there is found a special library of him. One of the most important books in here is surely ‘’Nutuk’’. Among of the other books are Turk and Islam History, Literature, Social Sciences, Turkish, Ottoman Turkish, French, English, German, Russian, Arabic, Persian, Slavic Books. Totally 3115 books are found here. 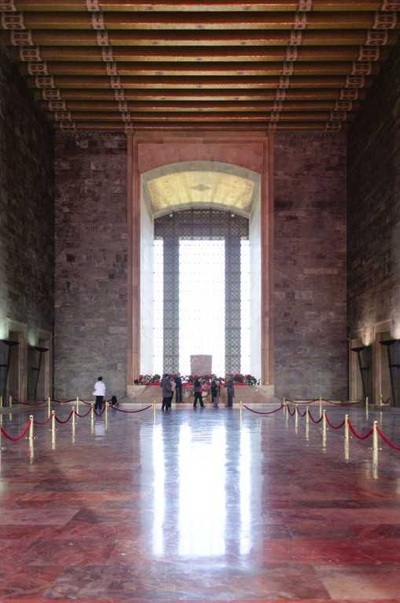 When you step into the Ataturk Mausoleum, you will see 24 lion sculptures on the each two sides of the road. Those fascinating lions symbolize both 24 Oghuz Tribes and the power. They also reflect the union of Turkish people. But most interesting thing is there are found the lions with the head bent around that tomb. One of the other valuable pieces in Anıtkabir is Flagstaff which is 33.5 m in high. It was sent from USA by Nazmi Cemal in 1946.